Union28 is a company that makes marriage apparel. Here is a little info about them: "Union28 was started by a married couple who knows what it is like to work through hard stuff and yet stay together and stay committed, choosing to forgive and be forgiven, only to grow in our love for each other MORE through it all." Their mission is to "encourage marriages and to honor the sacred covenant between a husband and his wife by communicating a positive image of marriage in a fun and stylish way." I love this whole idea and think that it is a great way to keep in mind that as a married couple, you still love each other. I got to review this awesome pink shirt that says "My Husband Rocks". Of course my husband loves it haha. It fits really well and is very long which is what I love in a tee. The company also makes really cute sweatpants and many different styles of t-shirts. The giveaway will be for a $25 gift certificate to Union28 to one lucky reader. The giveaway is open until Midnight on Thursday November 18th. Winner will be chosen on Friday November 19th using Random.org. Visit the Union28 website and let me know what you would buy with a $25 gift card! -In a comment, tell me why your spouse rocks (1 entry). My husband rocks because he is a great husband, father and has a great sense of humor. I'd buy the long sleeve angel wings tee! I love it! My spouse rocks because he's super handy! He replace our whole roof along with his dad. I love the LOVE (I love my husband) shirt. My husband rocks cuz he loves me even when I have pms. I would definitely purchase the bride white ladies cut tee and also the groom charcoal tee. They're both on clearance! Woohoo! 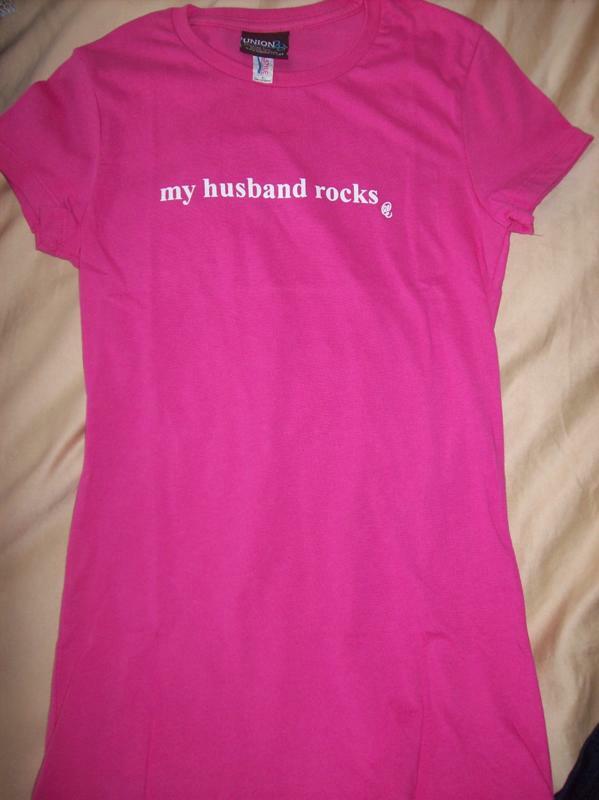 I would love one of the pink "My Husband Rocks" rhinestone tees. I really like the purple "I Love My Husband" shirt too! he also works very hard to provide for and look after our family. Thank you so much for stopping by my blog and I'm now following you! My spouse rocks because he has been taking care of me this last week since I have been sick. He always knows when I need to hear "I Love You"
I would get My Wife Rocks Chocolate/White Long Sleeve Athletic Tee and give it to hubs for christmas! Hi! Thanks for visiting me. Now I'm following you. I'm doing my first giveaway (CSN $35 ending 11/13) stop over and enter if you get a chance. What a hard decision! I would pick either the 'my husband rocks' fitted tee or the 'he loves me' tee. I subscribed to you via GFC. I would get the My Husband Rocks Drawstring Black Pants. i'd probably get the http://www.union28.net/women/my-husband-rocks-hot-pink-fitted-tee sooo cute! I'd get the My Wife Rocks Tee and give it to my husband. I entered your Reading Glasses Shopper website giveaway. Like My Husband Rocks Chocolate Giveaway. Entered your Reading Glasses SHopper GIveaway.